It is becoming more and more evident that climate alone does not explain spatial and temporal patterns of the world vegetation, and that disturbance regimes explain an important part of the variability in vegetation and biome composition and distribution . This has been suggested specially in tropical ecosystems where alternative vegetation states (e.g., forests and savannas) are possible for a given climatic conditions . For instance, in dry years, surface fires may enter in forests and kill fire-sensitive trees and select for fire-resistant woody species with open crown architectures that generates well lit communities with a flammable grassy understory. 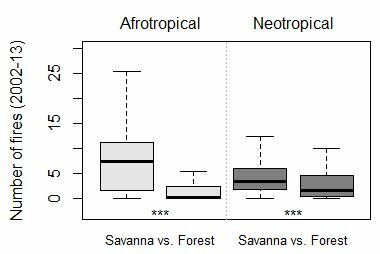 Forest trees and savannas trees have a marked difference in bark thickness (thinner in the former) and thus a contrasted sensitivity to surface fires . Thus, a switch to a forest state from a savanna depends on a sufficiently long fire interval or high resource availability allowing the outcompetition of shade-intolerant savanna trees and grasses (i.e. the inhibition of fires) by means of a closed canopy of forest trees. Similarly, herbivory can also exert a control on woody biomass and favour herbivory-resistant shrubs and grasses. However, empirical (field-based) evidence for alternative sates were very limited. In a recent paper  we used field data to show that, for a wide range of environmental conditions (in South America and Africa), fire feedbacks maintain savannas and forests as alternative biome states in both the Neotropics and the Afrotropics. In addition, wooded grasslands and savannas occurred as alternative states in the Afrotropics, depending on the relative importance of fire and herbivory feedbacks. That is, we found evidence for a disturbance-driven bistability in the Neotropics and a disturbance-driven tristability in Afrotropics (figure below). Fig. 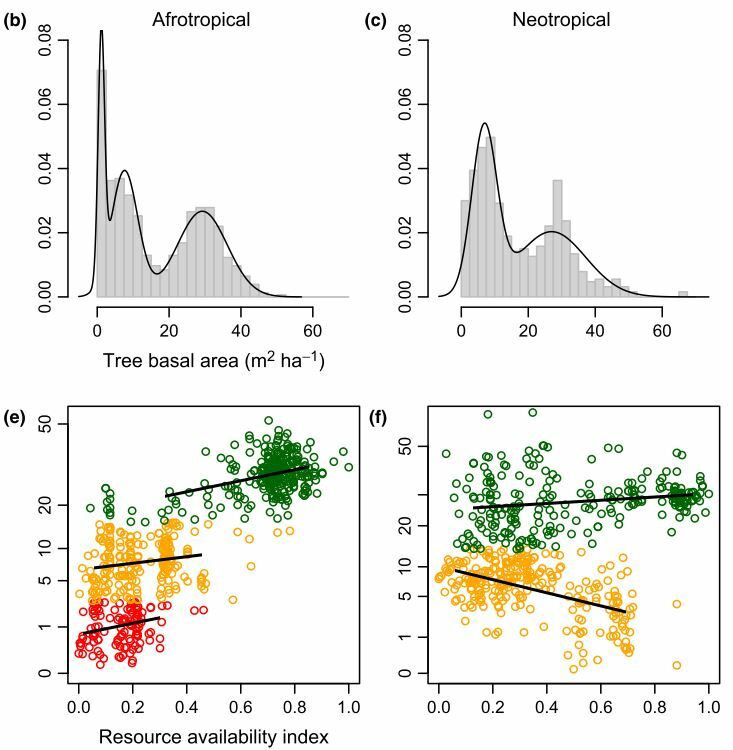 Top: Frequency distribution of basal area in afrotropical (tristability) and neotropical (bistability) ecosystems. Bottom: The discontinuous pattern of basal area along the resources gradient for both afrotropical and neotropical ecosystems (red: wooded grasslands; orange: savannas; green: forests). Note that there are regions of the gradient where two alternative vegetation types are possible; they are maintained by different disturbance regime (see ). Dantas V.L., Hirota M., Oliveira R.S., Pausas J.G. 2016. Disturbance maintains alternative biome states. Ecology Letters 19:12-19 [doi | wiley | pdf |supp.] – New!